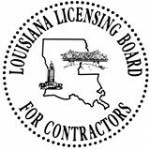 Straight Line Industrial Services Receives Its Louisiana Contractors License | Welcome to our Blog! This entry was posted in Uncategorized and tagged contractor, heat trace, Industrial Insulation, insulation, Louisiana, Louisiana Contractor, pipe insulation, tank insulation, tanks by m_mendoza. Bookmark the permalink.